In modules 2 and 3, students learned about the parts of the brain and how information is sent throughout the body. 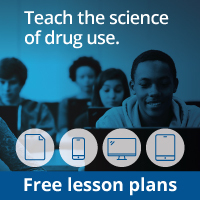 This module focuses on drugs - powerful substances that can change both the way the brain functions and how the brain communicates with the body. Some drugs are helpful when used properly: they fall into the category of medicines. Other drugs may have a harmful effect on the body. The purpose of today’s activity is for students to begin to understand how different drugs can affect the body. Students learn about different drugs and how they affect the body. Students classify drugs and their effect on the body into two groups: helpful medicines and harmful drugs. Students think about whether any drugs can be both helpful and harmful.